DALLAS (WBAP/KLIF News) — President Trump’s lawyer and former New York Mayor Rudy Giuliani will headline a fundraiser Monday in Dallas for U.S. Rep. Pete Sessions. 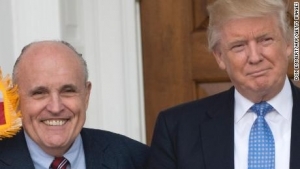 Giuliani was widely regarded as a national hero for his leadership of New York City through the emergency response of the terrorist attacks of September 11, 2001. Giuiliani is a long time friend and former business partner of Dallas businessman Roy Bailey, who is heavily involved in raising money for the Sessions and Trump reelection campaigns. Bailey told the Morning News that while his primary purpose for the visit is to support his longtime friend, Congressman Sessions, Giuliani may arrive in time to see his New York Giants square off against the Dallas Cowboys Sunday night.